What if the person who knew you best and loved you most forgot your face, and couldn’t remember your name? A care facility is everyone’s solution for what to do about Sara, but her husband, Jack, can’t bear to live without her. He is committed to saving his marriage, his wife, and their life together from the devastation of Alzheimer’s disease. 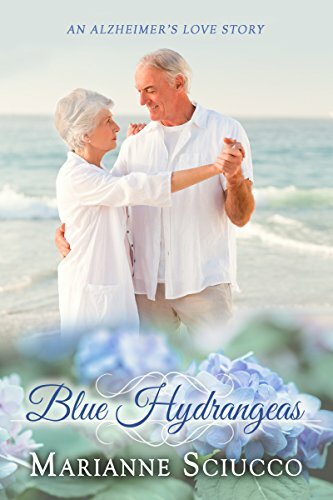 He and Sara retired years ago to the house of their dreams, and operated it as a Cape Cod bed and breakfast named Blue Hydrangeas. Jack has made an impossible promise: He and Sara will stay together in their beautiful home no matter what the disease brings. However, after nine years of selfless caregiving, complicated by her progressing Alzheimer’s and his own failing heart, he finally admits he can no longer care for her at home. With reluctance, he arranges to admit her to an assisted living facility. But, on the day of admission, Sara is having one of her few good days, and he is unable to follow through. Instead, he takes them on an impulsive journey to confront their past and reclaim their future. In the end, he realizes that staying together at any cost is what truly matters.